Physical conditioning is a key factor for you, and the work that you do now will pay off in spades when the time arrives. ReadyNutrition Readers, this piece covers something that can affect you quite adversely and make the difference between success and failure during a long-term emergency. We’re talking about muscle fatigue brought on by stress and overexertion. The precursor to that is the buildup of Lactic Acid. Doesn’t sound as if it’s such a big deal, does it? Read on, because it is something that can affect your ability to survive. As you may have deduced from previous articles, I am a big believer in weight training and physical training in general. Whatever your “thing” is, do it, and be consistent with it. You need a good, physical fitness regimen and a well-balanced diet. Even those with physical limitations should make this part of their daily lifestyle. By following after this, you can virtually eliminate problems resulting from Lactic acid buildup and muscle fatigue. Let’s go over some basics and delve into this subject. Lactic acid is an organic acid, and it is formed and built-up in your body’s muscles after strenuous exercise and/or stress. It can be produced when there is not adequate oxygen to the skeletal muscle system and other tissues of the body. Lactic acid also is formed during anaerobic muscle activity during a period of glycolysis, where your glucose isn’t changed into pyruvic acid and this is the factor that leads to a marked increase in muscular aches and fatigues. Anaerobic exercise, keep in mind, is the type that uses energy that is limited to short bursts of strenuous tasks or activities. Weightlifting is a prime example of such, as opposed to aerobic exercise where the body takes in a tremendous amount of oxygen over a longer period of duration. So what does all of this have to do with survival, you may ask? Here’s the answer: if you’re not in good shape already, the stresses and extra physical activity when a collapse occurs will be telling on your body. Already someone out there is smirking, but be advised: this advice comes with experience. When your power goes out and you have to haul water from a river or lake by hand, and have to walk ¼ of a mile with two 5-gallon jugs (they would weigh 75 lbs. ), you will see how quickly this will debilitate you. 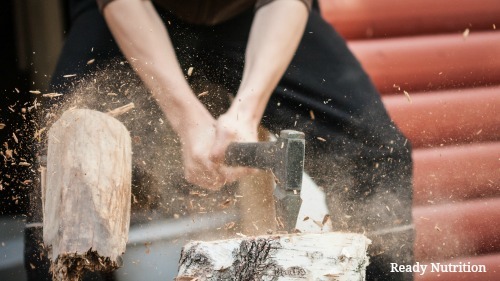 The stress and pressures of maintaining security for yourself and your family, the loss of electricity, and the need to build a fire (hence cut wood and move it) and do other tasks…this starts the minute everything collapses. As well, in a related article, Ruby Burks discusses some of these same viewpoints. There may be other physical challenges, such as an injury to a family member who needs to be carried to safety. You will not have time to wait and rest. All of these factors can make your arms and legs so sore as to not even be able to straighten them out, let alone do more work with them. If you work out 3-4 days per week, you will be building your muscles and body up, conditioning yourself to strengthen the muscles and thus avoid the problems with excessive Lactic acid buildup that leads to muscular weakness and fatigue. These daily strengthening exercises will give you a good head start. You don’t need an expensive gym membership – all you need is the will power and a few tools to get started. From when you first start working out, it will take you anywhere from 1-2 weeks to initially recover from lactic acid and soreness. Eventually it will go away, but you have to start somewhere. I strongly recommend a good protein supplement to take at least once per day to help balance your body’s needs for protein. Tissue repair is very important. There’s also some stuff out on the market (supplements) that can be used for recovery that aid in synthesis of proteins and cut your recovery time in half. I use this stuff called RapidDrive BCAA 5000, in a 9.33-ounce container that gives you 50 servings. The BCAA stands for Branched Chain Amino Acids, specifically L-Leucine, L-Isoleucine, and L-Valine at 3,000 mg, 1,000 mg, and 1,000 mg respectively. This stuff is micronized (pulverized) from larger to smaller molecules that are easier to absorb and uptake. These amino acids stimulate muscle protein synthesis, keep your proteins from breaking down post-workout, and preserve the glycogen stored in your muscles. Glycogen is fuel used by your muscles; when they run out of their natural supply, your muscles feed off of themselves, literally. All of this complicates and lengthens your recovery time. This stuff comes from GNC (the pro performance series), and it isn’t cheap: a can will run you $50.00, but I’m here to tell you it’s worth every penny. You can pick up a couple of cans (this is what I do) and FIFO them as you’re using one. It takes me about a month and a half to go through a can. I know this is stuff we’re mentioning for recovery, and it is: you can have some always on hand…that spare can, if you need it, to help you get rid of the Lactic acid buildup and protein debilitation that you will experience naturally as a result of a catastrophic event. I also use Beta-Alanine powder, with ½ teaspoon giving you 2,000 mg of Beta-Alanine that helps you with both muscular endurance and to reduce muscle fatigue as a result of lactic acid buildup. My stuff is made by Now Sports, and it’ll run you about $45.00 for a 17.6-ounce jar that gives you 250 servings. Between those two, my recovery time for a muscle group I’ve worked is down to one day. It is fairly expensive; however, my question to you is do you see yourself as being “worth” it? You would not skimp on a water filter, or on any kind of home canning equipment. How much less should you invest in yourself…your most important asset? Catastrophe is something that you are absolutely unprepared for, in any capacity. Once again, consult with your family practioner for his approval prior to taking any actions or using any of the materials recommended in this article. As preppers and survivalists, it is our job to be “well-rounded,” and I’m not referring to body shape. I am speaking about being well-rounded and well-versed on all of the different disciplines that go into surviving and preparing. Physical conditioning is a key factor for you, and the work that you do now will pay off in spades when the time arrives. I wish to encourage you…you can do it if you set your mind to doing it consistently and with regularity. You keep fighting that good fight, and keep a sense of urgency about all of it…without stressing! JJ out! What a great article JJ and the timing couldn’t be more perfect for me and I’ll tell you why. I recently landed a brand new job at a food processing plant that requires me to fill and move 300 lb stainless steel barrels ( thank goodness they are on large rubber wheels ) and cover 2 other machines clearing jams and light maintenance. This new job really keeps me on the move and I even have to resort to jogging between machines to keep up on the JIT schedule. This physical activity is tough on a soon to be 53 YRO man and yeah, I’m sore every night when I get home. I know my body will get used to exercise eventually but the products you recommended will certainly help my muscles recover more quickly. As it is I’m keeping the makers of Advil and Icy hot in business! I also liked the description of how glucose works in our bodies. That information is valuable because I’m a type 2 diabetic. I do eat properly and manage without drugs like Metformin but this heavy and fast paced work environment is going to benefit my preparedness and stamina. To tell the truth I never gave any thought to my physical conditioning because I don’t plan on bugging out but you never know. Besides, I don’t have to pay for a membership at a gym! ps. I run circles around my younger workmates because I cheat. I ask every long term employee to show me the easiest and fastest way to do my job and they happily share their techniques. Remember, old age and treachery will overcome youth and skill!